Yesterday Lewis Rue and I explored Indian Creek in the Mulberry Valley of Arkansas. From Lewis’ cabin near the confluence of Indian Creek and the Big Mulberry (which was running about 10 feet due to heavy rains), we tossed a couple of Dagger Torrent sit-on-tops in the truck and headed up the mountain. Topping out on Cadillac Hill, named for a 1950s heap filled with bullets on the roadside, we parked and unloaded our kayaks on the ridge separating Indian Creek and Lick Branch. A thousand feet below on either side, we knew both streams were raging in the mist. 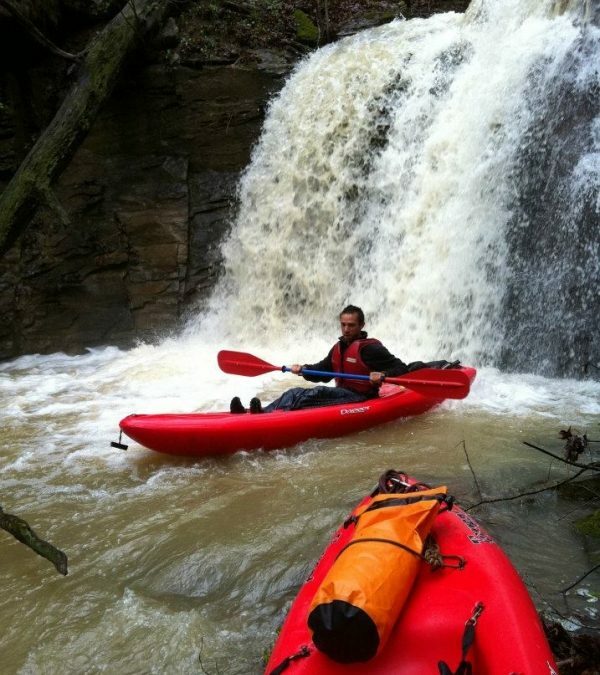 The terrain was wet and steep when we began dragging our kayaks down the Indian Creek side of the ridge. Our rope was used more than once to lower the boats past mossy outcrops of sandstone and limestone surrounded by ribbons of water. The boats were accidentally dropped a few times during the descent, sledding unmanned through the forest and stopping loudly against boulders and fallen logs. Eventually, we reached a point 600 feet below the ridge, a place where several rivulets join together. From here we hopped in our boats and began paddling down an unnamed gorge, hoping to reach its confluence with Upper Indian Creek. Along the way, we encountered several Class III drops and lots of mid-stream boulders and trees. We pulled over a few times to drag around log jams and at one point stopped short of a waterfall. Lowering around the drop, which had a shelf landing and log hazard at the bottom, we continued paddling toward the confluence with Upper Indian Creek. Reaching the east fork of Indian Creek about five miles above our destination at Lewis’ cabin, we found the main stream swollen and brown. Our Torrent sit-on-tops proved aptly named as they carried us down Class II and III waves. Hillsides of old growth oak, beech, and sycamore raced past on both sides, with redbuds and dogwoods making appearances near rocky places along the way. We stopped at the joining of Indian Creek’s east and west forks, taking the time to admire ruins of the old Baker place. The pioneer family homesteaded the south-facing ridge between forks in the mid-1800s. Hand-stacked walls of stone surround the area and go hundreds of feet along both sides of the creek. Even in abandonment, the Baker place remains a handsome farm. On the ridge above an undercut bluff is the lost village of Cobb. A trail winds up the mountain from the Baker place to what was once a community schoolhouse. Although hard to believe, this remote place was once a neighborhood. Looking up through the forest, I imagine pioneer grandmothers telling stories of Goldilocks and Red Riding Hood with an emphasis lost on the children of today. At 5 p.m. Lewis and I decided to get back to our river-running before dark. The joined forks increased the river’s volume to a point of being intimidating. Rapids remained in the Class III range, but occasional log jams−which had previously been easy to avoid−now became serious. We ran a number of surging rapids and made frequent stops to portage around logs. “That was the carving rock we just paddled over!” Lewis pointed behind us with his paddle. The old rock with pioneer markings is one of his favorite landmarks. He often hikes upriver from his cabin to show the historic spot to friends. It was deep underwater. On river left, we sailed past the confluence of Shop Branch, which looks to be a stream worthy of paddling on its own. On river right, Lewis’ favorite swimming ledge had become an undercut hazard that proved difficult to avoid. At last, we arrived at Lewis’ cabin and practically paddled onto his porch. We marveled that it had taken 20 years for either of us to float this treasure known as Indian Creek. Hopefully, we’ll do it again soon.